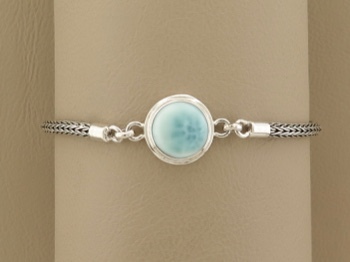 Larimar, a delicate drop of clear Caribbean skies and waters - the perfect connection to your favorite spot on the planet. 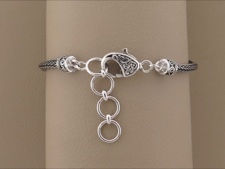 Designed to wear all the time, this bracelet wears easily with other hooking bracelets or is sweetly elegant all on its own. 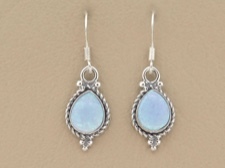 This Larimar cabochon is set in sterling silver with hinged sterling chain sides that have ornate ends. 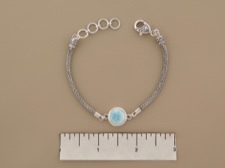 The sterling lobster clasp closes at 6.75 or 7.75 inches with two size options in between. You will never take this lovely bracelet off.